Chair Entertainment's Shadow Complex is due to land on Xbox Live Arcade this summer, a two-dimensional adventure that's unabashedly inspired by Nintendo's Metroid series, only rendered in 3D—pretty much exactly what Metroid and Castlevania fans regularly demand. So why did Chair opt to pursue a Metroid-style adventure for its second Live Arcade title? We sat down with Chair Entertainment creative director and co-founder Donald Mustard to find out. And to thank him. "It seems like there was this huge void," Mustard said, saying that Shadow Complex explores a largely unexplored genre. "No one's making these kinds of games. So we decided, well, we're gonna try it. My biggest secret hope is that some awesome game designer will look at what we did and think 'I could do that even better,' and make a game that I can play." "I already know where everything is in Shadow Complex, which ruins it for me," Mustard joked. One thing, though. Someone is making these games, as Koji Igarashi and the Castlevania team regularly pumps out "Metroidvania" games on Nintendo's portable platforms. But Chair didn't look to Igarashi's creations, instead going to the source. "We really looked at Metroid more than Castlevania," he said. "We made everyone replay Super Metroid, Metroid Fusion and Metroid: Zero Mission. Everyone on the team played that for a week or two, but I played them constantly... to the point where I had felt like I had cleansed my system of anything other than Metroid." 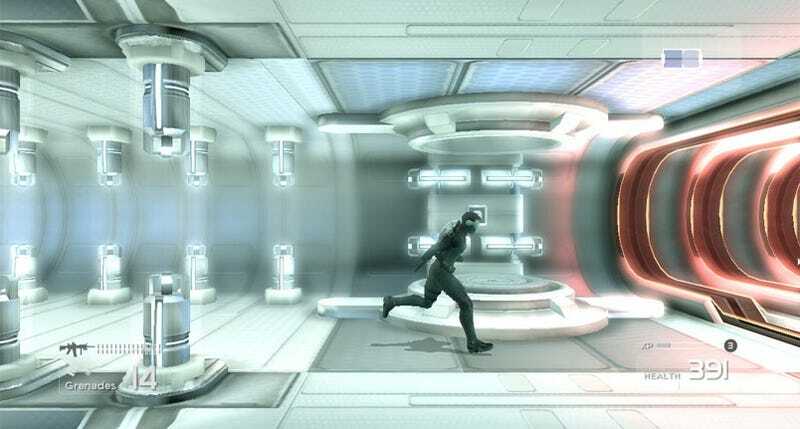 Mustard said he was cognizant of looking too closely at the inspiration behind Shadow Complex's game design, saying that there's "a fine line between doing a genre entry and doing a genre rip-off." After immersing themselves in Metroid, they avoided the title during Shadow Complex's two year development cycle. "We sat down, talked about what we wanted the game to be and we started designing what we thought it would be — then we never looked at Metroid again," Mustard said. "Because we then wanted to make our own game. And I think it was pretty effective, capturing that vibe of Metroid. We didn't want to be seen as derivative." What games like Super Metroid—and most Metroid games—didn't offer was much of a narrative, at least not on par with what we're expecting to see in Shadow Complex. That's a potential pitfall, considering how much time is spent backtracking and exploring, things that may interfere with a game-long story line. "I think you have to tell the right story," Mustard says. "Because so much of that kind of game is exploratory, and if you're doing it correctly, has a strong non-linear element to it." Of course, there is a Metroid exception. "Metroid Fusion had a really strong story to it," he notes "That's one of the ones I looked at the closest. I thought, 'What are the pitfalls that they fell into while doing this?'" "I think we tried very hard to structure the narrative more about a loose plot, but then kept it very character-centric. We were always trying to keep the narrative flowing." Mustard is obviously concerned about being compared unfairly to the decades old Metroid series, lamenting that "we can't compete with nostalgia"—words borrowed from our own Stephen Totilo. We'll have more from our interview with Chair at Comic-Con later this week.